No chain is stronger than its weakest link,as the saying goes. Nothing could be more true when it comes to managing heavy or bulky components between the key stages of the logistic value chain. The sheer weight of thousands of tonnes lifted each day wears the mechanics and the materials. Yet the forklift must perform flawlessly every day of the week. Reliably, productively, safely. 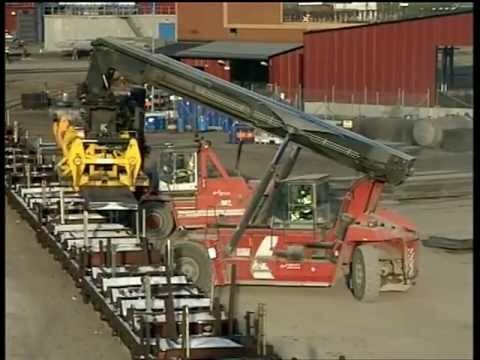 Your forklift is a vital part of your logistics or production. In seamless interaction with a skilled operator, the forklift must meet your – and your customer’s – demands of product quality and delivery precision, throughout your terminal, factory or assembly line. 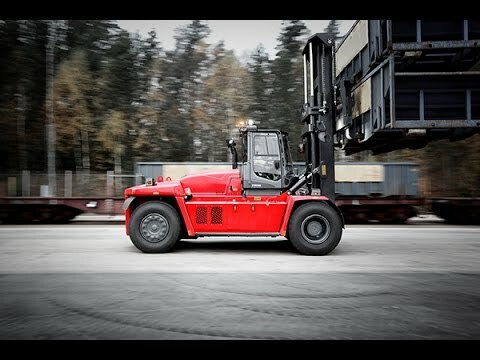 The new Kalmar DCG180-330 heavy forklift will always deliver what your operations require. With the Performance mode activated, operators will have the power necessary to go all-in at every instant and work with maximum productivity. Pushing it hard, while ensuring best-in-class fine-manoeuvring. Our Cummins engines are powerful, yet highly fuel efficient. All engine alternatives are compliant with the Stage IV/Tier 4 Final emission standards. The variable pumps automatically sense the load in every operation and adjust the oil flow accordingly, allowing for faster lifting cycles up to 40 per cent while reducing fuel consumption. This will improve your productivity a lot depending on number of lift cycles. Purchase price is only one of many factors affecting total cost of ownership. In fact, price is a minor cost factor looking over the lifetime of your forklift. What truly matters in the long run is cost control and operational efficiency – and that will show clearly on your bottom line. Compared to our previous model, the new DCG180-330 uses up to 15 per cent less fuel in standard configuration. By using the optional ECO mode you can save an additional 15 per cent. Add Kalmar’s renowned product quality and reliability, increasing efficiency and uptime, and you see the true value of Kalmar. For operators, our EGO cabin provides an outstanding driving environment, packed with features that support productivity, efficiency and safety. The curved front and rear windows give exceptional visibility at all angles, particularly diagonally, and the profiled beams eliminate blind spots. The whole interior has been designed with the driver in mind. More or less everything is adjustable to fit all kinds of drivers. For example, the steering wheel can be adjusted in every possible angle; it can even be tilted sideways. Operators will also benefit from a fully integrated, rotatable seat. An Over Head Guard is also available for hot or indoor operations. For our heaviest range, we are using the proven Kalmar DCF370-520.This heavy forklift truck is designed to meet the high performance and reliability demands of heavy-duty handling. This versatile forklift is the ideal choice for applications with long shifts, heavy loads and where power and precision are both key requirements. Steel mills and busy ports are the natural environment for these powerful machines. Operating a powerful machine like this puts high demands on safety and requires excellent all-round visibility. Our proven Sprit Delta cabin, can be customised with a variety of options to improve safety to meet your specific requirements. For drivetrain you can choose from either Volvo or Cummins engines, both of which meet the latest emission requirements. For customers outside the emission-regulated area we also offer Stage 3A engines. The latest generation of engines enables a low operating cost and together with an optional variable hydraulic system, it will further reducing running costs, while maintenance is straightforward thanks to easily accessible service and access points at ground level. Handling unitised cargo and containers inside vessels puts special demands on machine versatility, manoeuvrability and lifting capacity. 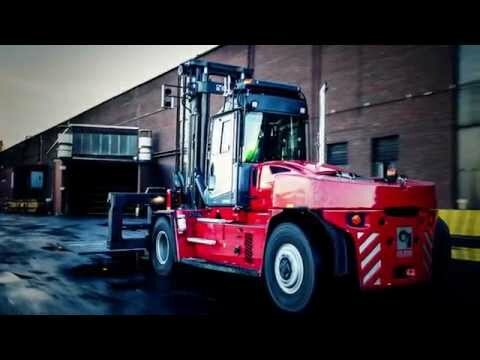 For operations like this, Kalmar's RoRo forklift is the natural choice. With a height less than 3 metres, Kalmar's RoRo forklift is operative inside vessels and other confined spaces. It has an impressive capacity in proportion to its limited dimensions and tight turning radius.The short wheelbase makes it easy to operate both inside and outside the vessel. Available in capacities from 28-33 ton. The Spirit Delta cabin allows excellent visabillity in all directions. Safety has always been on of Kalmar's top priorities and this range of machine is no diffrent. The machine can be equipped with a number of options that increases the drivers safety awarness.